I was averaging 90 mph on the drive from Los Angeles to the Grand Canyon. I had cracked all my windows open just a quarter and the wind was spinning my hair into tangles. “American Girl” by Tom Petty blasted on the speakers, though I could barely hear it over the sound of my grouchy old car taking the lithe, stretched-out turns of Route 66 into Peach Springs. I sped down the highway, past the tiny buttes in the distance and the glistening wild horses with a cocoa butter sheen, shriek-singing along. The hour or so before you get into Arizona, I-40 skates along the base of the Mojave Dessert, baking all your exposed limbs in the unbroken sun. Strings of hair stuck to little patches of sweat around my face. It was a great big world, with lots of places to run to. There’s a myth that Petty wrote “American Girl” about a young woman who leapt to her death from a dorm at the University of Florida. Petty himself plainly disproved it. Still, it’s hard not to feel like he’s singing about a person on the edge. In hindsight, the Grand Canyon seems like an odd place for me to have run to. A suspicious choice — wide rims of mile-deep cliff, mostly unfenced — for an act of spiritual rehabilitation, five days after I’d threatened to jump off a bridge. And if I’m being completely honest, I wasn’t so sure I’d be able to stop myself from pushing my body into the canyon once I got there. I was afraid it would be irresistible. All that big red emptiness begging for a body. The thing about the song “American Girl” is that it is completely reflective. It’s impossible to listen to the song and not see yourself in the “girl raised on promises.” It’s an anthem for anyone whose life didn’t turn out the way he or she thought it would. And so it is painfully, triumphantly available to everyone. The psychiatric wing of an emergency room is a funny place. The EMTs rolled me in on an upright stretcher. We passed a smiling man wearing an eye patch. “Welcome to my domain,” he said, chuckling. I learned later that the eye patch was actually a lopsided sleep mask, given to him to block out the bright fluorescents of the hall since they’d run out of rooms. Still, it didn’t stop me from associating the night with a sort of immaterial piracy. They set me down at a bed next to him, separated by some random, indefinite hospital machinery. I changed into a gown but kept my pants on. I had spent the night quietly giving up every totem of my power and agency. I was going to keep my pants. I cried in big, dramatic fits for three hours while a rotating cast of doctors waited for my adrenaline to melt away and tried to get me to explain what happened, the facts of the night. I found it impossible to bridge the gap between the two: the facts of the night and what happened. 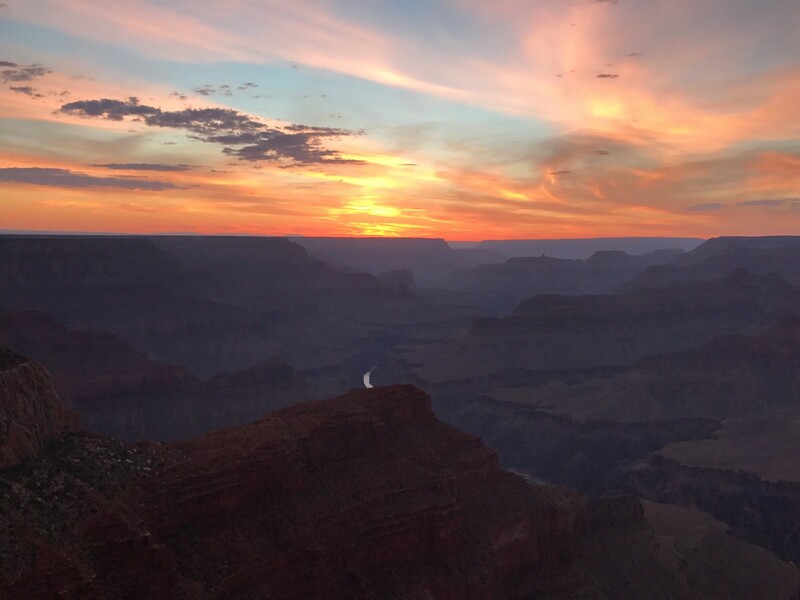 I decided to drive to the Grand Canyon five days after a suicidal episode because it seemed like the most accessible majesty. I needed to see something urgently, uncontroversially beautiful. For reasons more medicinal than aesthetic: I thought that, faced with incontrovertible proof that splendor existed and could be accessed, I would be shocked awake. I could actually make happiness inescapable. I just needed a bigger aquarium. More exciting fish. When I arrived at the Grand Canyon it was only a few hours from dark. My body felt it before I saw it, finishing the climb up Route 64: the vertigo, the speedy pulse, the whirling pull of a gargantuan split in the earth. I sat on the ridge and stared at shapes several hundred thousand times older than America, a couple million than me. When night fell I watched with my toes on the edge of the South Rim as the canyons absorbed the yolky, exploding sun and the mesas became blue-black waves crashing against the sky. I realized that, without much preparation or foresight, I had thrown myself into conversation with the history of the world. And suddenly I knew it was never about beauty, but endurance.